Moonlight Cinemas and Giant Pizzas..! After an unforgettable road trip around New Zealand this January we flew back to Australia for the last leg of our adventure! Our flight landed at Sydney International Airport at around 5.30pm and we spent our first night back with our friends, Luke and Kristen, eating homemade meatballs and having welcome back drinks. It was Richard’s birthday a few days later so we celebrated with a trip to the Harbour and a visit to one of our favourite bars – the Beresford in Surry Hills. We were soon joined by Luke and Kristen, who encouraged us to stay out for most of the evening! Unfortunately, we couldn’t stay out too late as we had to catch a 9am bus the next morning. We’d booked a 14 hour ride with Greyhound to Melbourne where Richard’s sister, Sarah, lives and where we would be spending our last two months in Oz. The 1200 kilometre journey wasn’t actually as bad as we thought it would be – Richard spent at least 13 of the 14 hours reading Bravo Two Zero by Andy McNab, while I kept myself entertained by watching the three movies that Greyhound put on for us! We arrived at Melbourne’s Southern Cross Coach Station at 11pm and were picked up by Sarah who had invited us to stay with her. We’d heard great things about Melbourne and were looking forward to getting stuck in to the sights and sounds over the coming weeks! Our first couple of weeks in the “second most liveable city in the world” (according to Economist Intelligence Unit) was pretty eventful. 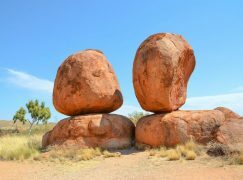 I was in Oz on a Working Holiday Visa so was planning to work until returning to the UK and spent the first few days job hunting, opening bank accounts and generally getting settled in. However, we did find time to take part in some ‘typically Melbourne’ activities. 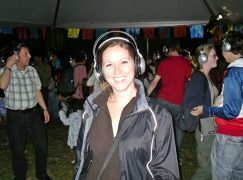 The first of these was a visit to the beautiful Royal Botanic Gardens for the Moonlight Cinema. The cinema runs throughout the summer months – taking advantage of the balmy evenings and we were there in time to catch one of the last showings of the season. We got together some nibbles, picnic blankets and cushions for the occasion, headed down to the gardens and settled down for the movie. As the movie, ‘Morning Glory’ began to play we were dismayed to feel a few drops of water hit our faces. We had heard about Melbourne’s reputation of “four seasons in one day” and had the feeling that we were about to experience what it meant. Sure enough, the heavens opened and it absolutely poured with rain! We didn’t have any umbrellas with us so ended up having to throw all of our food onto one picnic blanket whilst using the other one as a shelter – taking it in turns to hold it up! Whilst our soggy Moonlight Cinema wasn’t quite what we expected we still had a fun night and looking back now, the thought of us huddled up under a picnic blanket, trying to watch a film in the pouring rain was quite hilarious! The next day we went to check out one of the many events and festivals that take place around the city throughout the year. 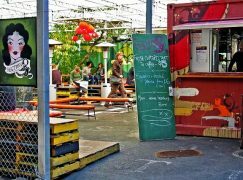 There is generally something going on every weekend in Melbourne, it’s just a case of taking your pick! This week it was the turn of the Dolce Italia festival in Carlton – north of the CBD. This event celebrates all things Italian and is held in Lygon Street at the centre of Melbourne’s Italian community. The street was chock full of attractions such as live opera singers, fashion shows, food stalls and a carnival. There was even a Formula 1 car on display in preparation for the upcoming Australian Grand Prix which attracted quite a bit of attention! 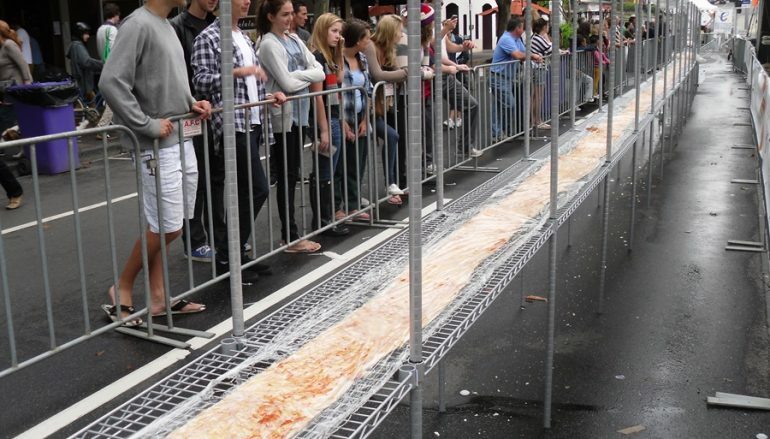 The main focus of the festival was the Guinness World Record attempt for the world’s longest pizza! The record to beat was 1,010.28 metres and was achieved by a team of chefs in Krakov, Poland on 29 August 2010, so we were intrigued to see whether they could beat it. Unfortunately, the pizza broke at around 600 metres! It looked in quite a sorry state towards the end, but all was not wasted as it was then divided up and given to local charities. With the festival drawing to a close we headed over to Docklands where another event was taking place – the Anatolian Culture and Food Festival – which celebrates Turkish Anatolian culture. Around 50,000 Turkish people live in Melbourne – the largest concentration of Turks within Australia and the waterfront area was buzzing with the sounds and smells of Anatolia, the western two-thirds of the Asian part of Turkey. It was soon time to return home where we tucked into our first Sunday Roast in nine months – the perfect end to our weekend! We had much more planned for the weeks to come, but first I had to get back into ‘work mode’ as I was due to start work in Melbourne city centre the next day!.. Famous Beaches and Fantastic Festivals..! 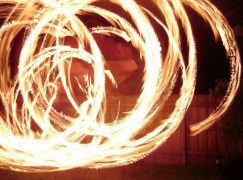 “I’m a Fire-Starter, a Twirling Fire-Starter”..!